Clockwise: Escorregador Waterfall; Governador José de Magalhães Pinto Avenue; "Terra Mãe" monument; Praça da Estação (Station Square) with the Sobrado dos Pereira (Pereira's House) in the background; partial view of the city; Saint Sebastian Mother Church; Colégio Angélica (Angélica college). 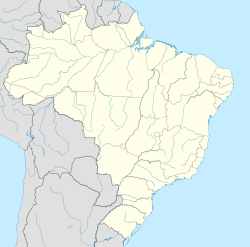 Coronel Fabriciano is a municipality in the state of Minas Gerais in the Southeast region of Brazil. It is located in the mesoregion of the Vale do Rio Doce and microregion of Ipatinga and is situated 200 km from the capital. The municipal population was estimated in 2016 by IBGE in 109,857 inhabitants, thus the 28th most populous in the Minas Gerais state. The area is 221.252 km² (13.1549 km² of urban area). The municipality was emancipated from Antônio Dias in 1948 and its name is a tribute to Lieutenant colonel Fabriciano Felisberto Carvalho de Brito. The town was situated in the Vale do Aço (Steel Valley) metropolitan area, between the largest steel industries of Minas Gerais state; Usiminas, in Ipatinga, and the Aperam South America, in Timóteo. These industries were situated in Fabriciano at they time they were constructed, and were essential to the development of the city. However, these facilities are located within the area of Ipatinga and Timóteo respectively, which were emancipated from Coronel Fabricano, and incorporated proper in 1964. Coronel Fabriciano is located in the Serra dos Cocais, home of many natural attractions of the city like the "Pedra Dois Irmãos" (Two Brothers stone), the "Pedra do Caladão" (Caladão stone), the "Cachoeira do Escorregador" (slide waterfalls), the "Trilhas da Mamucha" (Mamucha trails), and other waterfalls and trails. Outdoor sports are popular such as hiking, trekking, mountain biking, parachute jumping, and 4x4 offroading. The city also features historical monuments like the "Catedral de São Sebastião" (Saint Sebastian Cathedral), the "Colégio Angélica" (Angélica College) and the "Monumento Terra Mãe" (motherland monument). The Human Development Index (HDI) is 0.755, classified as high by the United Nations Development Programme (UNDP). With the inauguration of the Calado Station, they began to be lifted up the first homes, very poor and basic. Only in 1928 was built, with the exception of the train station, the first house covered with ceramic and floored. The first name of the place when virgin forest, was Barra, for finding located in the confluence of the ribeirão Caladão, starting to denominate Calado (Quiet), with the inauguration of the Rail Station. Almost time, Raul Soares was denominated, returning the Calado (Quiet) name again. In August 1938, it was baptized with Coronel Fabriciano Fabriciano name, in honor to colonel Fabriciano Felisberto of I Break, for occasion of his/her centennial from birth. Ten years later, the municipal district was created being dismembered of Antônio Dias. On December 27 of 1948, after a long process gone through the procedure in the Legislative Assembly of the State, governor Milton Campos signs the Law no. 336, creating the municipal district of Coronel Fabriciano. The official installation felt in the day January 1 of 1949, in session presided by the peace judge José Anastácio Franco. It assumed as manager Dr. Antônio Gonçalves Gravatá, with the different objective of to organize the municipal administration and to give him/it to the official mayor, elect for the population. It is like this, the March 15 of 1949, they take ownership then the mayor Dr. Rubem Siqueira Maia, vice-mayor Colonel Silvino Pereira, aldermen Nicanor Ataíde, Lauro Pereira, Ary Barros, José Anatólio Barbosa, Wenceslau Martins Araújo, Sebastião Mendes Araújo, José Paula Viana, Raimundo Martins Fraga and José Wilson Camargo. In spite of the emancipation and December 27 of 1948, an agreement was signed with the local parish, in which the birthday of the city is commemorated on January 20, day of the patron of the city, São Sebastião. Senador Melo Viana district's area. São José dos Cocais, in the Serra dos Cocais, municipal countryside. Most of the city's main avenues (Avenidas) and streets (Ruas) are named after important people. Some of them are in blue below, linked to their Wikipedia article. The city is between Ipatinga and Timóteo, that base the largest and more modern siderurgic industries of Minas Gerais: Usiminas and Arcelor Mittal Timóteo, respectively. Coronel Fabriciano, those cities and several others, are in the Metropolitan Area of Vale do Aço, where Fabriciano is the second largest city, and has the third GDP. Trading, services, eucalyptus monoculture, small and medium industries are the main activities in Coronel Fabriciano. According to official statistics of the city hall (http://www.fabriciano.mg.gov.br), the commercial activities include 3.561 registered establishments, of the most varied branches. The section of services involves 3.275 names registered, with prominence for the branch of Hostelry: there are about 1.800 accommodations, and 400 of them are framed in the categories "three" or "four stars." Eucalyptus, from rural areas, is used by Cenibra, a Brazilian-Japanese cellulose factory in Belo Oriente. It is also used by local charcoal factories. Several factories are based in the city, many of then in the Industrial District. The mountains of Serra dos Cocais in Fabriciano is usually used for extreme sports. Motorcycles and bikes are often used. But it's also common to make slow rides by foot or by horse in these calm mountains and see the waterfalls. The city's Jeep Club, Jipe Clube Vale do Aço, often organize jeep travels and competitions. In 2008, Fabriciano hosted the 3rd race of the state's 4x4 Regularity rally Championiship. Colégio Angélica, a school founded in 1950. Downtown Fabriciano, with neighbour city Timóteo visible in the horizon. Mountains of the Serra dos Cocais. Corpus Christi procession of the Saint Sebastian Parish. ^ a b Instituto Brasileiro de Geografia e Estatística (IBGE) (January 15, 2013). "Área territorial oficial" (in Portuguese). Archived from the original on June 23, 2017. Retrieved June 23, 2017. ^ a b Instituto Brasileiro de Geografia e Estatística (IBGE) (August 30, 2016). "Estimativas da população residente no Brasil e unidades da federação com data de referência em 1º de julho de 2016" (PDF) (in Portuguese). Archived from the original (PDF) on August 30, 2016. Retrieved June 23, 2017. ^ Embrapa Monitoramento por Satélite. "Minas Gerais" (in Portuguese). Retrieved February 25, 2013. ^ Prefeitura (June 3, 2009). "A criação do município" (in Portuguese). Retrieved February 25, 2013. ^ Prefeitura (March 1, 2012). "Patrimônio Cultural" (in Portuguese). Retrieved February 25, 2013. ^ Prefeitura (August 7, 2009). "Sugestão de passeios: roteiro para o meio urbano" (in Portuguese). Retrieved February 25, 2013. ^ Atlas do Desenvolvimento Humano, Programa das Nações Unidas para o Desenvolvimento (PNUD) (July 29, 2013). "Ranking decrescente do IDH-M dos municípios do Brasil" (PDF) (in Portuguese). Archived from the original (PDF) on October 13, 2013. Retrieved June 23, 2017. This page was last edited on 8 December 2018, at 19:53 (UTC).